Shark attack. 20 mL Monin blue curacao syrup. 20 mL Monin Asian lemongrass syrup. 45 mL rum. 1 lemon peel slice. 20 mL lemon juice. 1 g. sea salt. 60 mL Perrier. 15 mL le fruit de Monin strawberry. 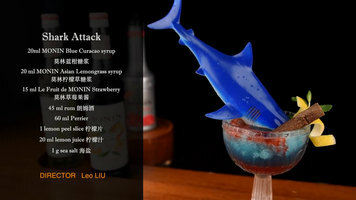 Watch this video to learn how to make a fun, shark-themed summer cocktail using various Monin syrups! Containing quality ingredients, this Monin 750 mL premium blue curacao flavoring syrup is a quick and easy way to add new flavors to a variety of recipes! Add a splash of this blue curacao syrup to your popular cocktails and mocktails and it's sure to please your guests. The sweet, orange taste and blue color of this flavoring syrup will enhance the fruity profile of your mixed or blended drinks without overpowering them or being too sweet. Plus, it's produced with pure cane sugar and no artificial flavors, making it an all-natural syrup with a balanced blend of flavor and aroma that will instantly upgrade your tropical lemonades, sodas, and smoothies. Since 1912, Monin has had a passion for delivering premium products that simplify the beverage-making process. Their sense of innovation and creativity has led to a wide variety of flavors and recipes to suit any menu. 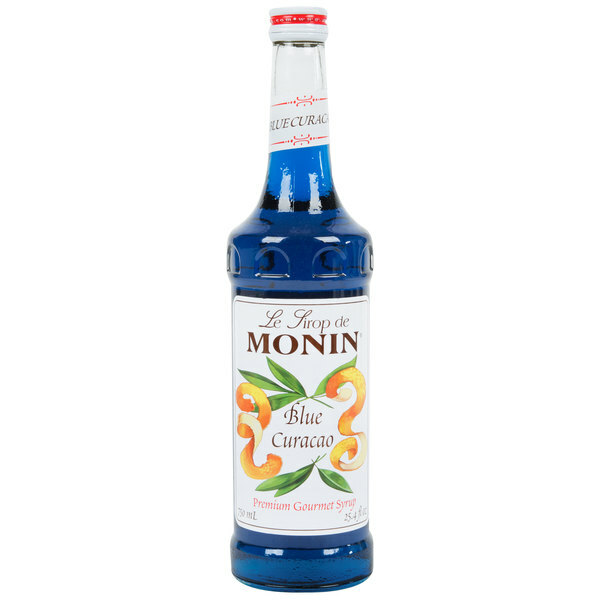 Use this Monin blue curacao syrup and craft superior beverages for your guests! Monin Blue Curacao is not a really strong flavor. I personally use it just for the color. It looks really cool in teas and cocktails. Blue curaçao is one of my all-time favorite flavors. I love it with coconut, I feel like a real life pirate--but without the diseases and missing teeth, and with a lot more luxury. This is the best blue curacao flavoring syrup that you can buy. There is no other brand that we trust more than we do the Monin brand. It makes your drink so much better. I love the blue curacao because it is fun colored and makes great looking and tasting cocktails. A great quality product and works great with our bar. This blue curarao syrup is so much fun to use. It’s petfect for making cocktails for the grown ups but also fun drinks for the kids. Very nice bar syrup that is great for making fun layered shooters. The blue curacao has a great taste and the price is so much better than local stores. A really cool flavoring syrup that is great for adding color to drinks. The blue curacao is really fun and is a great bar syrup to have. Whenever I am making cocktails that call for blue curacao, this is what I use. It is not too strong and it really makes a cocktail that much better. We have to make sure that this is on our auto reorder list because we go through this premium blue curacao flavoring syrup like crazy. It is amazing! The blue curacao flavoring syrup is a great addition to any bar. I love the bright blue color and great taste that this adds to our cocktails. Premium Blue curacao syrup can be used in mock-tails, cocktails, and flavored tea. The sweetness of it is not very strong, and the flavor is perfect for your drinks. A great flavoring syrup that is awesome for coloring drinks and making unforgettable cocktails. We make a blue hurricane drink that is a crowd favorite. Blue curacao is one of the major bar syrups which is must have for any bartender. And this one from Monin is top of the line! It is blue in color but big on the orange taste. It adds fruity and colorful flavor to cocktails and non alcohol drinks. The color makes it more fun. The Blue Curacao flavored syrup adds color and a light orange flavor to lemonade, lemon lime sodas, and alcoholic beverages. It was perfect for the 4th of July holiday weekend. I was very glad that Webstaurant has Monin syrup. Blue Curacao has a vivid color and great taste. It doesn't taste too sweet or artificial. It goes so well with lemonade.